Andy Weir author of The Martian speaks in Long Now’s “Conversations at The Interval” series this Tuesday. Andy will talk about the real science of a Mars colonization mission. What would Martian colonization really be like? What would it take to get us to the red planet? What would we do to establish a colony once we landed? Andy will speak live at The Interval, Long Now’s cafe/bar/museum/headquarters in San Francisco. We will stream his talk live (and free) for Long Now members on the member site. Then Long Now’s Peter Schwartz will interview Andy onstage. 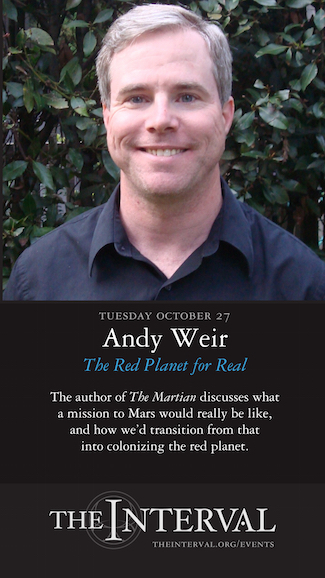 We’ll have copies of The Martian on sale and Andy will sign books after he speaks. Tickets to this event sold out quickly, as our Interval talks often do. Due to the huge interest we will be live audio-streaming Tuesday’s talk for members. We also livestream our monthly SALT series as a free benefit for our members. Current Long Now members, just login on the member site. You can join Long Now for just $8/month; benefits includes tickets to Seminars, HD video of 12 years of Long Now talks, and many other perks. While we don’t currently live stream all our Interval event, we hope to do so increasingly in the future. We also plan to release Interval talks as podcasts and video on the Long Now site (similarly to our Seminar series). Long Now is seeking a major sponsor to fund the cost of producing this series to the standard of our Seminar media. Sponsorship inquiries are welcome.